Alerted by AiG’s Ken Ham using Emmanuel College in Gateshead, Britain, as a venue for a public lecture, secular humanists erupted in howls of protest that the school exposes its students to young-earth creation. Despite Emmanuel’s outstanding academic record and glowing reports from education standards inspectors, leading evolutionists Richard Dawkins, Steve Jones and others blasted government endorsement (and funding) of such schools. Questioned in Parliament, Prime Minister Tony Blair strongly defended faith-based schools and highlighted Emmanuel College’s ‘very good’ results. The Guardian, 9 March 2002, pp. 3, 19; 14 March, p. 2; 16 March, p. 7. The Independent (London), 17 March 2002, p. 15. The Daily Telegraph, 18 March 2002, p. 20. Nature , 21 March 2002, p. 250. Fossil termites (genus Mastotermes) recently found in amber (fossil tree resin) are so well preserved that researchers were able to recognize the bacteria in the termites’ digestive system. Dated as being ‘20 million years old’, the bacteria look just like the digestive bacteria found inside the termites’ closest living relative, Mastotermes darwiniensis. New Scientist, 16 February 2002, p. 23. The evolutionists’ problem of living things staying essentially the same over (imagined) millions of years of random mutation and natural selection is made worse, as one generation of these micro-organisms is many thousands of times shorter than, say, a generation of humans or dogs. Note that the termites, too, have remained essentially unchanged over all that alleged time. Any dinosaurs that survived the impact of an asteroid which supposedly collided with earth 65 million years ago are said to have died out afterwards from starvation as the resulting pall of dust blocked out sunlight, reducing plant growth. But geologists are having trouble finding evidence of enough globe-encircling dust at that time to fit the theory. What is more, if a dust cloud really was responsible for dinosaur extinctions, then there should have been many more such impact-triggered extinctions from other asteroid impacts—but evidence is lacking. Science, 22 February 2002, pp. 1445–1447. Archaeologists analyzing stone tool artifacts have discovered that Neandertals affixed wooden handles to flint knives by means of a ‘superglue’ made from birch pitch. Despite the ‘bumbling reputation’ of Neandertals, the ability to make this adhesive reveals substantial technical know-how—it would even be difficult for modern manufacturing plants to duplicate. The smouldering process to turn birch bark into usable glue only works at a temperature of 340–400ºC (644–752ºF) and under exclusion of oxygen. Lower temperatures prohibit resin in the wood from melting, and higher temperatures would burn tar exuded from the birch. lsquo;The very fact that birch bark pitch was identified (in the artifacts) already proclaims the intellectual and technical abilities of the Neandertals’, the researchers concluded. 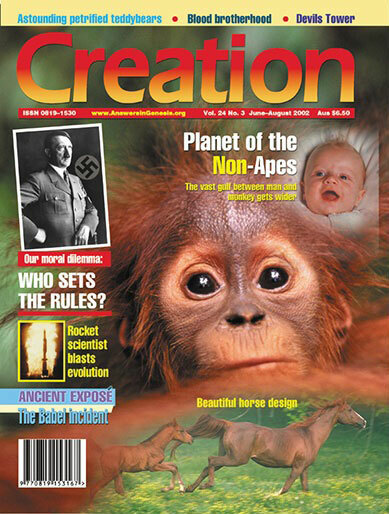 Discovery Channel, <dsc.discovery.com/news/briefs/20020114/neanderthal.html>, 22 March 2002. Long-age ‘progressive creationists’ such as Hugh Ross, in order to reconcile their belief in the evolutionary ‘millions of years’ with the belief in a literally created Adam, are forced to claim that the Neandertals were ‘spiritless quasi-humans’. How much easier to just take Genesis as written, which leads to the conclusion that they were fully human descendants of Adam. A geologist has further discredited claims that Martian meteorite ALH84001 contains evidence of past life on Mars (see Creation Mars bacteria disputed 24(2):7) by demonstrating that the same ‘remnants’ can be duplicated by purely natural, inorganic means. Heating a synthetic rock to 200ºC and then quenching it in water yielded structures of ‘the same size, same shape, same beveled edges and same lined-up atoms’ as in the meteorite. Thus, a natural collision on Mars could have generated the heat and pressures capable of producing the structures mistaken for evidence of life. University of Dayton News, <www.udayton.edu/news/nr/030502.html>, 5 March 2002. Bone is remarkable for its ability to satisfy two nearly contradictory requirements—being stiff yet not brittle. It can withstand huge stresses without splintering because it somehow absorbs and dissipates energy like a shock absorber. One proposed explanation is that bone contains ‘sacrificial bonds’ that are designed to break under stress, soaking up the energy that might otherwise fracture the bone. Research now appears to show that when individual collagen fibres are briefly stretched, ‘Velcro-like’ bonds between coiled collagen molecules actually break (rather than merely stretch), reforming slowly as the fibre retracts back to normal size. Why people help others has long puzzled evolutionists. Theories invoking nepotistic or selfish motives do not explain why people frequently cooperate, often in large groups, with genetically unrelated strangers, with people they are unlikely to meet again, and when reputation gains are small or absent. To try to answer this question, researchers designed a ‘public goods’ game (using volunteers) and concluded that cooperation flourishes only in an environment where punishment of non-cooperative individuals occurs. However, as punishment was costly and yielded no pecuniary benefits to the punisher, researchers are now trying to explain why people were prepared to ‘altruistically punish’ others for the public good despite no benefit (in fact, at a cost) to themselves. Nature, 10 January 2002, pp. 125–128, 137–140. Ultimately, our love for others and in-built sense of justice come from God (1 John 4:8,16,19). Christian behaviour, such as giving gifts anonymously (Matthew 6:1–4), makes absolutely no sense from an evolutionary framework. Northern US populations of pitcher plant mosquitoes have undergone a distinct genetic shift to take advantage of longer growing seasons in recent decades. Researchers could detect the change in just five years. The increasing proportion of mosquitoes with the adaptive trait means that northern populations are now more similar to southern populations, where longer, warmer growing seasons are the norm. Proceedings of the National Academy of Sciences USA, 4 December 2001, pp. 14509–14511. While the researchers claimed that this change represented an ‘evolutionary response’, it is not evolution in the molecules-to-man sense, as there has been no increase in genetic information. The adaptive trait, common in southern populations, merely became more numerous in northern populations once seasonal conditions moderated to permit its survival. Creationists are often wrongly accused of disbelieving ‘natural selection’. On the contrary, natural selection is an observed fact—but natural selection as such is not evolution. Researchers have found that minerals in the earth’s interior can hold substantial amounts of water. They therefore estimate that the lower mantle alone may store about five times more water than the oceans. The transition zone (between the lower and upper mantle) holds around six times more than the oceans. Science, 8 March 2002, pp. 1885–1887. These figures support earlier-quoted estimates of 10 to 30 times the amount of water in the earth’s present oceans being stored in the mantle (see Drowned from below, Creation 22(3):52–53)—a massive subterranean reservoir for the ‘fountains of the great deep’(Genesis 7:11). 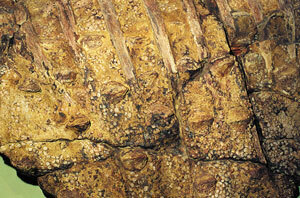 Fossilized skin of dinosaur ‘Minmi’, Australia, by Lorraine Walker. A duck-billed dinosaur (Edmontosaurus) unearthed in South Dakota has considerably more fossilized skin than other dinosaur fossils. The animal had a leafy residue in its mouth, suggesting it died while eating. Ajc.com, <www.accessatlanta.com/ajc/epaper/editions/Friday/metro_c31550c4315d01640060.html>, 25 January 2002. Fossil evidence all over the world speaks of rapid burial in a global Flood—not slow-and-gradual buildup of layers over millions of years. The increasing push for a British national holiday on ‘Darwin Day’ (12 February—the anniversary of Darwin’s birthday [see Darwin Day Creation 23(3):9]) has included calls for an atheist to present Radio 4’s Thought for the Day, and for a lesson on evolution to be preached at Westminster Abbey. Renowned evolutionist and ardent atheist Dr Richard Dawkins (an Oxford zoology professor who features on our video From a Frog to a Prince) supports the idea, even offering to do the preaching himself. ‘I’d do it like a shot’, he said. Guardian Unlimited, <www.guardian.co.uk/Archive/Article/0,4273,4334369,00.html>, 22 January 2002. Interesting that many Christians still try to say that evolution is a ‘side issue’ for the church. Researchers looking to develop non-polluting marine paint have discovered that the skin of pilot whales has a specialized nano-structure that resists the buildup of organisms such as barnacle larvae. A parasite-resistant gel oozes out of tiny pores surrounded by raised ‘nano-ridges’, too small for organisms to get a grip on. If any larvae, bugs and other contaminants manage to cling on by latching onto air bubbles on the skin’s surface, these are usually dislodged when a whale crashes back into the water after an acrobatic leap—which may explain why whales engage in such behaviour. The researchers plan to patent a manufactured version of the whale’s skin as an anti-fouling paint. New Scientist, 1 December 2001, p. 15. Yet another invention derived by mimicking the Master Designer’s handiwork. A family of lions in a Siberian zoo has been identified as Cape lions, a subspecies previously thought to have become extinct when the last Cape lion in Africa was shot in 1865. A South African zoo director recognized the lions from photographs—Cape lions (not shown here) have a bigger body than other lions, a thick black mane and distinctive black tips on their ears. The Cape lions in Siberia are reported to be descended from a lion left behind by a circus many years ago. This is not the first time that supposedly extinct subspecies of lion have apparently been found surviving in small populations. It is thought that former Ethiopian leader Haile Selassie’s personal troupe of lions (later moved to a zoo in Addis Ababa) were descended from Barbary lions, previously believed extinct. BBC News, <news.bbc.co.uk/hi/english/world/monitoring/media_reports/newsid_1007000/1007452.stm>, (reported 5 November 2000), 7 March 2002. This confounds notions that species cannot survive when populations are reduced to a few individuals and reinforces the plausibility of the biblical Ark account. our love of music is merely a pleasurable side-effect of the evolution of other perceptual abilities. But our brain’s reaction to musical stimuli goes far deeper than the perceptual skills of the auditory cortex in the temporal lobes. E.g. a working memory is needed to store ‘snatches’ of melody, harmony and rhythm while our brain makes sense of the whole tune, and our emotional response to music is processed in structures distributed more widely through the brain. Nature, 7 March 2002, pp. 12–14. Man’s love of music did not evolve—it was in-built from the beginning (Genesis 4:21). A British researcher has observed a sheep preying on and eating a bird. The sheep snatched the grouse in scrubland—behaviour normally associated with a carnivore, not a herbivore. Herald Sun, 21 February 2002, p. 9. Many similar accounts (e.g. Creation 21(4):9; 22(2):5) may provide hints as to how species became carnivorous after the Fall.